Jehu arose from his seat and went out from the meeting place to a private place with the young prophet. After the young prophet finished speaking, he quickly opens the door and ran out. King Joram was recovering from his wound at Jezreel after fighting against King Hazael. King Ahaziah was with King Joram because he is paying him a visit. At this time, Jehu was discussing with his army officers how he can kill King Joram. After that, Jehu rode in his chariot and set out for Jezreel. So King Joram sent out a second rider. King Joram decided to ride his chariot out and meets Jehu and his men himself. When King Joram was trying to run away, Jehu shot an arrow. 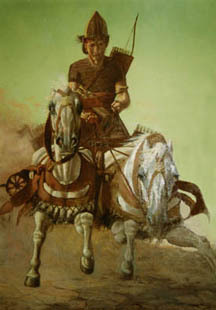 The arrow hit the part between the shoulders of King Joram. The arrow goes through the heart of King Joram and King Joram collapsed dead. When King Ahaziah saw these, he tried to escape but one of Jehu’s armies shot him and he fell down dead too. King Ahaziah’s officers carried King Ahaziah’s corpse back to Jerusalem and buried him beside his ancestors.